Get moving outdoors with walking, hiking, biking ,jogging, or running on the many trails Huntington County has to offer. Combine being outdoors with a little bit of exercise – and surprise yourself with how great your body and mind feels. HARTA has developed a new activity to get you, your family, and friends out their experiencing the trails and having fun. Get healthy and have fun at any Trail, DNR Property, or Acres Land Nature Preserve located in Huntington County and win great prizes at the same time. 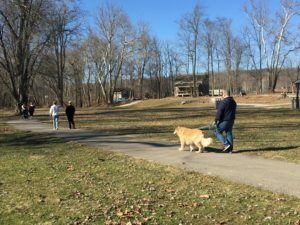 Between April 13 and November 30, we invite you to walk, run at least twenty-five (25) miles or bike at least fifty (50) miles at one of many trails located in Huntington County. Keep track of your adventurers below. All property regulations and any trail restrictions apply. When you complete your mileage, send this form to us (HARTA, attn Kelly Frank, PO 5005, Huntington, IN 46750) or scan it and e-mail it to info@HARTA-GoTrails.org . We will enter you in a drawing for some great prizes, including an Indiana DNR State Park Annual pass. All forms must be submitted by December 15 of the participating year. To get started just download the Trail Challenge Log Sheet and head out to your favorite trail.